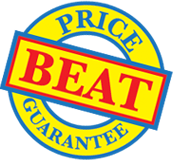 Binding wires from £6.93 per 250. 10 colours from stock. Fast UK delivery. Wire bindings in international standard 3:1and 2:1 pitches. Click the 'specification' tab for colour and paper capacity guides. 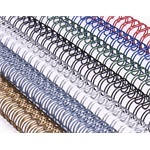 Compatible with all main brands of wire binders (except Ibico). Click on a radio button to select a wire and colour. Click on the "add to basket" icon on the line you have selected. Enter the quantity you require in the box on the pop up window (which then appears). Use with Binding Bazaar binding covers to finish reports and presentation documents where heavier paper is being used and a more upmarket appearance is required. The wire pitch represents the number of holes per inch; either three per inch (3:1) or two per inch (2:1). 2:1 wires are best used for thicker documents. Please note that due to variations of colour reproduction on computer screens, the colours you see should be regarded only as approximate guides to the actual colours. Back-to-back document opening allows easy handling and photocopying. Pages register perfectly when closed. The strength of wire helps to retain sheets securely. Up to ten stock colours in A4 help you to match to your document covers. Nylon coating permits smoother page turning. If you prefer to order from a simple list of binding wire products, you can simply buy from the list of binding wires below.